Oatmeal isn’t just for breakfast anymore! In the last couple of weeks I’ve seen two amazing recipes for savory oatmeal and just last month my sweetie asked what to do about punching up the typical morning porridge. Swap the milk for stock, cinnamon for thyme and raisins for mushrooms and VOILA! And why not? We prepare just about every other grain as a savory dish so now it’s oats’ turn to shine in a whole new way. 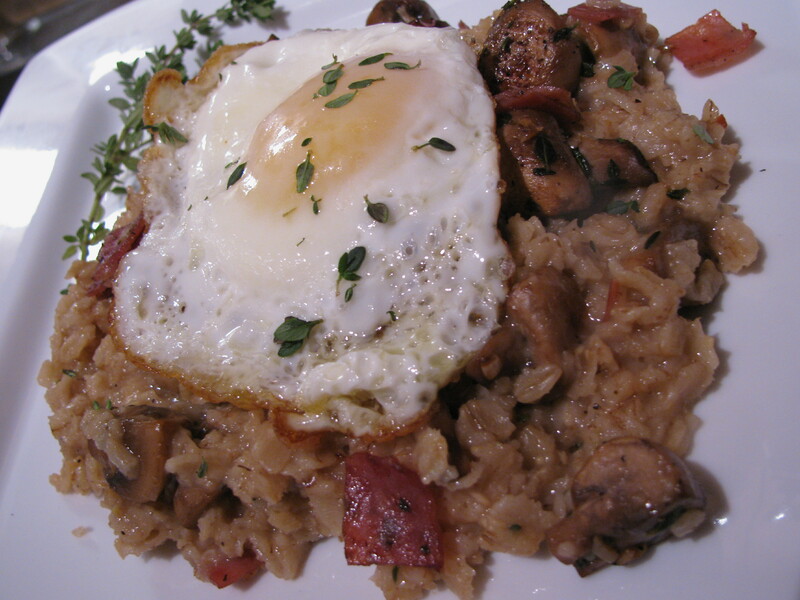 This recipe is simple…oats, mushrooms, ham and cheese along with a few seasonings and topped with a fried egg. That’s it! Simple, quick, hearty and believe it or not….less than 400 calories a serving! I made this last night and wish I had doubled the recipe. This brings a whole new meaning to breakfast for dinner and I just know you’ll love it!! Now get cooking! Heat a large pot over medium heat and also a large sauté or fry pan over medium high heat. Strip the leaves off the thyme and roughly chop. 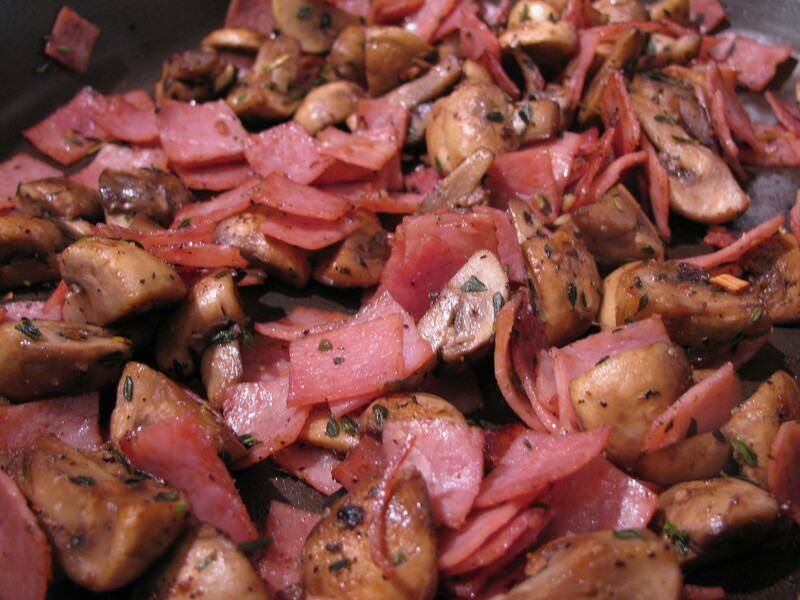 Wipe the excess dirt off the mushrooms and cut them into quarters. You can also use pre-sliced which need no cleaning!! Slice the ham into ½ inch pieces. Crush the garlic with the flat end of your knife, remove the skins and mince it up. Add 2 tsps of EVOO to the pot and let it heat for a minute. Add the mushrooms and sauté until they start to turn brown. Add the garlic and thyme and cook for another 2 – 3 minutes. Make sure you stir it often to keep the garlic from burning. Next add the ham and sauté the mixture until the ham starts to crisp and the mushrooms are cooked through. Next add the stock to the same pot and crank up the heat to bring it to a simmer. Use a wooden spoon to scrape up any bits (those bittles have loads of mushroomy, hammy flavor!!). Once it’s simmering, add the oats and cook for 5 minutes or until most of the stock is absorbed. Add the cheese and half of the ham and mushroom mixture and give it a stir to combine. Add the last 2 tsp of EVOO to the sauté / fry pan, let it heat for 30 seconds and then crack your eggs into the pan. Sprinkle each egg with a bit of salt and fry until the whites are set (about 3 – 4 minutes). FYI The heat is higher than usual for eggs but this creates lovely, crispy edges that I LOVE!!! Divide the oats into bowls, top with some of the remaining ham and mushroom mixture and a fried egg. Serve immediately. Try topping this lovely dish with shredded or sliced chicken breast. Nom, nom, nom! Shitake or morel mushrooms would rock this dish! Don’t be afraid to experiment with other mushrooms. No parm, no problem! Try cheddar, swiss, fontina or even your good old wrapped singles. Just make sure you dice or shred it before you add it. I’m just wake up…..:)may i have some:)???? Of course you can Massi! There’s always a place for you in my kitchen. Thank you! I thought it would be good…but it turned out awesome! I hope you do try this and let me know what you think. Excellent! I’m so glad you liked it! It is rather filling and I admit I was ravenous the day I whipped this up, thanks soooooo much for trying this and giving feedback! Same here! And oatmeal is a great blank canvas so whatever combination you add is sure to be tasty! Lovin this kind of savoury oatmeal to starting a day…. lovin it’s even more with crispy bacon!